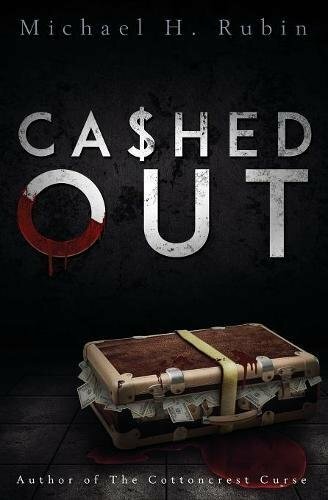 “Cashed Out” by Michael H. Rubin is a fast-paced legal thriller featuring an unsuccessful lawyer, his corrupt ex-wife, and a shady client involved in a large corporate cover-up. Set in a swampy bayou in Southern Louisiana, readers will find themselves right in the middle of the action that doesn’t stop until the very end. Michael H. Rubin presents readers with a well-written, fast paced legal action thriller. I enjoyed the narrator’s voice – so funny at times and sarcastic, definitely entertaining. The action is described so vividly that it was easy to picture in my mind, almost like watching a movie, and the descriptions of the bayou area transported me directly into the action. Filled with dialogue, the plot flows perfectly, as characters developed and unraveled through the dialogue. Schex is a character with genuine flaws, easily identifiable with readers. I honestly found it hard to put this book down, and finished it in a couple of sittings. I am more than comfortable recommending “Cashed Out” by Michael H. Rubin as a five-star legal/action thriller to anyone looking for a fast-paced awesome read!